Pakistan leg-spinner Yasir Shah is approaching prime form after a long time. The 32-year old made comeback for Pakistan against Australia in the recently completed series after a year and he is playing in their series against New Zealand. In the Abu Dhabi Test, Yasir ripped New Zealand's batting lineup apart by picking up eight wickets. However, unfortunately for him, Pakistan lost the match by 4 runs. But among all this, the leg-spinner is closing in on the biggest milestone of the 21st century which Indian off-spinner Ravichandran Ashwin missed out by just one match. Yasir Shah is eyeing the record of the fastest bowler to reach 200 Test wickets. The record is unbroken since 1936. Australian leg break bowler Clarrie Grimmett achieved this feat back in 1936 in his 36th match. Since then no other bowler could claim this record. In 2016, Indian off-spinner Ravichandran Ashwin approached this record but missed out by one match. Ashwin is at second spot now as he achieved this feat in his 37th Test match. Now, another Asian spinner Yasir Shah is ready to end the wait of those long 82 years. 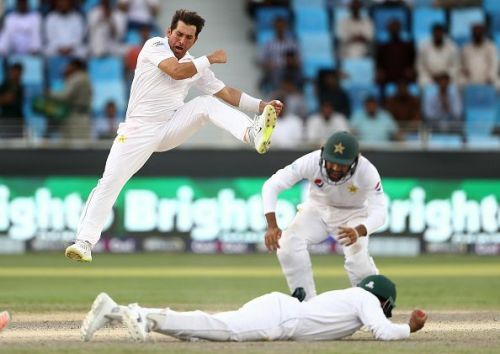 The Pakistani spinner has taken 181 wickets in just 31 Tests. As he will play the next two tests in UAE. So it is highly likely that he will get closer to the record as he is usually lethal in these conditions. Yasir's Test bowling average is 29.39. In UAE, it drops down to 25.90 which clearly indicates he can try every possible trick to notch a significant part of the remaining 19 wickets in the next two matches against New Zealand. Pakistan great Waqar Younis achieved this feat back in 1995 in his 38th test. It should be a massive honor for Yasir to eclipse the greatest bowler of Pakistan at the same time. If Yasir does not manage to create history in UAE, then he'll have to try his luck in South Africa where Pakistan will play 3 Tests during December and January. He has never played a Test in South Africa. So it'll be interesting to see how he performs on South African soil. There are still question marks regarding Yasir's effectiveness in overseas conditions. In England, his average is 40.73. In Australia, it's way too high at 84. Hence, the upcoming South Africa tour will be a huge opportunity for him to prove his worth in away shores. There's also an all-time record for the taking.